Created with my own stock photo's, my Photoshop digital art and my twisted mind. The Shadow Over Innsmouth is a novella by H. P. Lovecraft (1931). 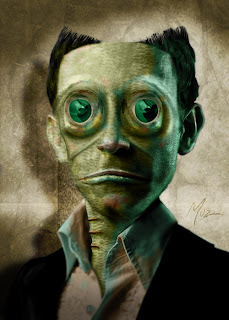 The story describes a strange hybrid race, half-human and half an unknown creature that resembles a cross between a fish and a frog, that dwells in the seaside village of Innsmouth (formerly a large town, but lately fallen into disrepair). The townspeople worship Cthulhu, Mother Hydra, and Father Dagon, a Philistine deity incorporated into the Cthulhu Mythos.